We throw that phrase around casually in our civic discourse. But sometimes a new law passes that doesn’t make a dent in the problem, as reporter Melissa Sanchez found when she looked into the bleak and arduous process of filing a wage theft claim in Illinois. Long wait times and high dismissal rates are nothing new at the Illinois Department of Labor, where every year thousands of workers file grievances against employers who have allegedly shorted their pay. 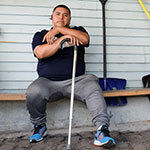 A 2012 Reporter investigation, “Waiting in Vain“, revealed the average wage theft claim took about seven months to resolve, with 41 percent ending up dismissed. Five years on, the Reporter followed up on this story to see how things worked out. It took half a dozen Freedom of Information Act requests and several months of delays, denials and appeals before the department handed over all the wage complaint and other operational records we requested. Our findings: Wait times for wage theft cases had increased to nine months and dismissal rates jumped to 58 percent. The promised reforms didn’t deliver. Putting things in demographic context, we took a closer look at the workers who filed wage theft complaints. Aggregating complaint counts by home ZIP code, and combining that with U.S. Census data on workforce numbers, we were able to identify areas of Chicago with the highest rates of wage complaints per worker. The Census confirmed these ZIP codes are overwhelmingly black and Latino with higher-than-average poverty. We also found high complaint volume from smaller companies in the health care, transportation, construction, landscaping, manufacturing and service industries. To show our work, we’re publishing the source data and analysis used to report this story. Sometimes, there already is a law. And once in awhile, it’s worth checking out how it’s working. Un análisis de miles de denuncias de robo de salario muestra que hay poca probabilidad de que un trabajador recupere su sueldo en Illinois.